Watch a preview of what we offer! Learn Spanish abroad in Costa Rica! 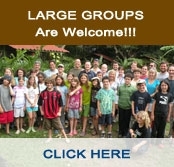 Rancho de Español Language School is your place in Costa Rica to learn Spanish. We have been offering Immersion Programs since 1993 with an effective and proven methodology with the most professional teachers. Our methods can be personally designed according to the goals of individual students. We are strategically located in la Guacima de Alajuela. Rancho de Español is a school specialized in the education of Spanish as a second language. We emphasize the improvement of conversational skills of our students, reinforce grammatical knowledge and motivate the utilization of new vocabulary. We can specially design each course to meet the specific needs of the age and intentions of individual students. We offer Intensive and regular Spanish courses which include either a homestay program or on-campus lodging, cultural activities such as Latino dancing classes and Costa Rican cooking classes. For those who prefer the more private atmosphere or are not interested in taking spanish lessons at the El Rancho Lodge, we have family suites and standard rooms of double and single occupancy with private bathroom, A/C, Cable TV, solar-heated water and unique decoration. Whether you would like to try authentic Costa Rican cuisine or dishes suited to your individual taste, visit our El Crisol Restaurant, which overlooks the swimming pool.